Hello AVA users! Welcome to my first tutorial! 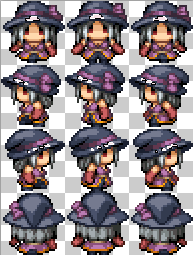 Here I'm going to show you how to recolor sprites; something that is frequently requested. Now you can do it yourself! It's actually very easy, and I'm going to show you how to do it with several popular programs. So get ready for your first step spriting! Click on the spoiler to see how to recolor sprites using any version of Photoshop! Step 1: Open & Select your color! Pick a sprite to recolor, and which color you want changed. You can either use a pallet for the colors, or pick them from another sprite. 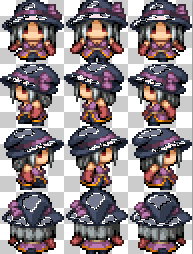 I am going to use a pallet to recolor the RTP witch/magician. 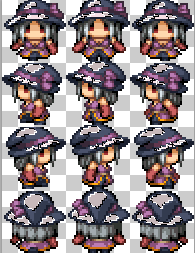 Let's make her hat lighter instead of that purple/black color. 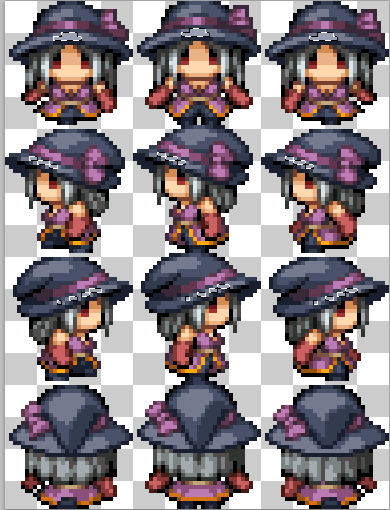 Sometimes changing a color to the entirely opposite one will give the sprite a new mood. So have your sprite picture open, and your pallet (or sprite that you want to swap the colors with). Tolerance must be 0 so it will not highlight any similar colors at one time. It will only highlight the same exact color. Unchecking "Contiguous" will make it highlight all of the color in the entire picture, rather than just the spot you selected. It'll make sense in a second! Click on the lightest shade of the color you want to change. In most cases, there are 5 shades for each color.If you are a little color blind, try starting with the darkest color. This has been known to work better for you! When you click the lightest color, a blinking box should appear, like this! Now go to the tab with your pallet or sprite. You'll want to use the Eyedropper ( ). You do not have to make adjustments to the settings with this tool. Simply click on the lightest shade of the new color you want to replace the old one with. This will copy the color so we can use it in our next step! Alright! Now lets go back to our sprite, where our selection should still be in that blinking box. Select the Paint Bucket ( ) and adjust the settings just like the Magic Wand. Tolerance "0" and uncheck "Contiguous". You'll only need to adjust these settings one time. Isn't that a relief? And now the process begins! Click anywhere inside the blinking box to paint it the color you copied. Now all you have to do is repeat these steps for every shade! Just for good measure, I'll guide you through one more shade. Select the Magic Wand tool again and click on the second shade. It is usually touching the previous shade you selected. Now go back to your pallet and select the second shade with the Eyedropper again. And then go back to your sprite and use the Paint Bucket to paste the color in your selection. Keep replacing the colors until you reach the darkest shade. And there it is! You can do this with any color and any part of the sprite. You can go on a recolor spree and change the entire sprite! I did each individual pixel at first. Luckily I changed over to Paint.Net pretty quickly, and learned the wonders of holding shift! Fun Fact: I am slightly colorblind, so I always work with the darkest color first when filling in sprites, then work my way to the lightest color. @LadyLeilani You're colorblind too? That's weird, women can't be colorblind by birth. Did you get a concussion in your lifetime or something? @Blackmuffin: I was born that way; women can also be colorblind, but it's extremely rare.